Besides a few long weekends, it had been a long time since our January vacation, so we planned a week get away and thought it would be nice to see a closer part of the country that we hadn't explored. I also wanted to eat a cold water lobster with the nice claws at a good price. We were hoping to see the trees changing colors, and hoping for good weather and got lucky on both counts. The colors were good to great and the weather cooperated with temperatures starting in the high 70's with 50's and sprinkles one morning being the worse. Usually the weather was in the high 60's and clear. I would say a week later would increase you chance of even better colors, but we were happy with what we saw. When we first started planning we were going to take extra days to drive, but with our new granddaughter, Lynn wanted to fly to get back sooner. So we swapped the gas and hotel cost for airfare cost. We started our break by flying to La Guardia Airport, in New York Saturday, Sept. 27th, and catch our ride Lynn scheduled to the port with Carmel (40 going, 45 coming back), coupon codes online to get $4 and $3 off if you print them and get a code. It was a convenient way to travel and I used a credit card both ways. The car going was clean, new, nice and relaxing, coming back, an older mini van not as clean. If you add the tip to the card they only have pre-programmed rates of 20, 25 or 30% tip. Going was worth the 20% but coming back the driver took two phone calls and a text while driving, which made me a little nervous. 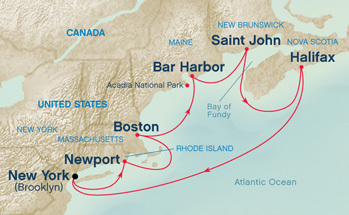 This trip cost around $100 per night each for the cruise. We had a promotional match of around $350 per person from our January cruise which got it down to that rate, and our normal inside cabin. Airfare around $500 for both. Our travels started by getting up at 5:00 am, off to the airport by 6 and dropping off the car at V.A.L.E.T. parking around 7 and flew away at 8:30. All went smooth and our one check suitcase showed up with not problem. We called Carmel and had a smooth trip to the port. It was a little long wait to get on as the Coast Guard took a while to give permission to board, but we were still on by 2:00 and had lunch, then unpacked and settled in Cabin C105, Caribe Deck, Level 10, first inside forward cabin. The port in Brooklyn was delightful because we were docked right next to Lady liberty and were able to get some good sights and pictures. First night they had the Amazing Spider-Man II for movie under the stars. It was nice, but unlike our past experiences with Princess, no one was there to hand out blankets, or pass out cookies and pop corn. This trip seemed to have some unexpected laps of service compared to past experiences. We tendered to shore which was a fairly long ride due to a no wake zone most of the way, but it was into a nice port. Once on shore we walked to the Cliff walk which was about a mile away. The temp hit 79 degrees but we had clear skys and a cool breeze off the water. The trail is 3.5 miles long and walks along the cliff side of many mansions. It was great views and had 80% of the path smooth, 15% fairly easy, and 5% a challenge for those not comfortable with heights or very rough terrain. Lynn slipped a couple times but luckily did not get any back bumps or scrapes. After making it to the end we realized we had to walk back to town which meant another 3.5 miles. We stopped for ice cream to refresh as we were starting to feel tired and then explored town, with the oldest synagouge as Newport's constitution was the first separation of church and state which allowed religious freedom. All told we walked around 10 miles and were tired when we headed back. So tired we skipped the first formal night and headed to the Horizon buffet on 16. Lynn: First port was Newport Rhode Island, a very quaint New England Harbor and we walked about a mile into town by the beach to start the cliff walk. Beautiful scenery along the 3 1/2 mile cliff walk; it was a beautiful sunny day, beautiful views of the sea and the backside of some really neat mansions. A few areas that had questionable and scary footing but we made the whole cliff walk & took the street, with the mansions entrance back towards town. We went to the Newport creamery for ice cream and then walked around a bit & stopped in the harbor for a beer before boarding the tender back to the ship. We walked off and took the bus organized by the ship to town, $15 each. It was a long ways away so worth the money. Weather started out at 73 degrees, and started getting cool at the end of the day. We started searching for the Freedom trail (dropped off at State and St. and Atlantic Ave.) and found it after a short search. The freedom trail goes by many historic sights and is well marked with double red bricks along the whole route. The Freedom trail is 2.5 miles long, but where we were let off was the middle of the path, so we had to chose what to do and where to go. We asked about a paid guided tour, but the person selling them told about three different stories of how it worked (three separate tours, a whole tour, then no whole tour available) so we were confused enough to go talk to the National Park tour which is a free guided tour, and since we would have had to waited over an hour for their next tour, we decided to do it on our own. We started out going North from the site of the Boston Massacre, Faneuil Hall, Old State House, Paul Revere's house, past the Copp's Hill burial grounds (early 1700's cemetery), Bunker Hill Monument (we walked to the top which was 294 steps up and took some pictures), then stopped to see the ship the USS Constitution. Then back mainly on the same path, stopping for ice cream and then on past to do some of the south end. We saw statues depicting the Irish potato famine which Boston sent food to help, and as it started to get darker and colder so we headed back to see the Holocaust Memorial before heading back to find the bus. We estimate another 7 miles of walking and the Freedom trail was interesting to explore, but we were ready to leave the big busy city. Lynn: Next port was Boston where we took the ships shuttle bus into town and did the Freedom Trail. Did the north end area first, in Charlestown area & around Paul reveres house, to Copps hill/cemetery & up by Bunkerhill where we climbed up the monument (294 steps up & 294 down); pretty scary coming down but beautiful views from above. Went to see the USS Constitution before walking back into the downtown area, walking some more of the Freedom Trail by Fenwall Hall, Quincy market and also going to see the Holocaust Memorial. Tender into town. In retrospect, this was probably my favorite stop. It was nice and peaceful, with a lot of trails to explore if you have the time. I got my lobster I wanted in town and Lynn broke down to have one also. At the Lazy Lobster for $13.99 you can get a approximate 1.25 lb lobster, or for $18.99 which we both did came with either a lobster bisque or seafood chowder. We tried one each and tried the chowder and bisque. I topped it off with a local dark beer. All was excellent, and fresh. The cold water Maine lobster was sweet and juicy. I had a baked lobster at dinner on the ship (caribbean warm water lobster) and it was nothing close to the flavor or texture this boiled lobster. We went to the National Park center at the back of town and purchased passes for $5 each. This allowed you to ride their Free Acadia Shuttles. The shuttles have seven different routes. We started in Bar Harbor, Village Green and took the 1 bus which started running at 9 am to the 4 bus and got off at Sieur de Monts to explore. Then back on and to Sand Beach. From there we walked along the coast past Thunder Hole and to Otter Cliff. From there we got on the 3 bus and rode it back to Bar Harbor. We had our Lobster lunch and then explored the town shops. If you had a day or two you could explore more of the park. The colors were changing and nice, as was the shoreline views. Leaving the town, Princess was not displaying good customer service as they had us sitting on the tender for about 20-30 minutes with the engine and diesel fumes stinking while they waited to pack the tender full. They did not even open the side window to help us with fresh air as the crew sat outside and played on their phones. Lynn: Next stop Bar Harbor Maine; what a lovely lovely port! We walked up to the little center in town and did the Island Express bus to Arcadia National Park. Made our first stop and got a little trail hiking before taking the bus to Sand beach. What a spectacular area and then we did the 2 mile walk along the oceanfront for some spectacular views and pictures before hopping back on the bus going back in to Bar Harbor. Made our way to the lazy lobster in town and had a phenomenal steamed lobster and chowder lunch. Walked around town before heading back to the ship this was another tender port. We had a car reserved from Enterprise and after getting some instructions, headed out of town planning on driving through Fundy National Park to the Hopewell Rocks and then along the coastal roads back. Unfortunately they did not give us a good map or recommendations. As it turned out our drive out was longer than expected (drove over 200 miles) and the shoretime was shorter than we would have liked as we were suppose to be back on the boat by 3:30. We got on the highway and the colors of the trees along the way were great. This area had the best colors of our trip. We did stopped at a few spots, to take pictures like the village of Alma where we saw boats sitting on the bottom with the tide out, stopped for a cinnamon bun, and made it to the gate of Hopewell Rocks. Lynn went to get information at the gate and discovered it would be 15 min. each way, plus time to explore, so we decided to head back and possibly still go along the coast instead of the highway back. It was a long drive and when we had to made a decision about heading along the coastline, I worried it would take to long, so not to stress we just headed back to town and went to the Reversing Rapids to check it out. We then turned in the car and were dropped off at the top of the hill so we could walk through the Old City Market and then down to the ship. In retrospect we would have stayed closer and done the shore loop first not going all the way to Hopewell Rocks with our short day, but at least we saw a lot of tree colors along the way. Lynn: In St. John New Brunswick the colors were peak; rented a car and beautiful drive to Fundy National Park area. Stopped for what was reportedly world-famous sticky buns in Alma. Unfortunately I didn't have directions and we took the path that didn't follow the waterfront but we still had some spectacular views and it was basically a Color Drive day for us. Made a stop at reversing Rapids before heading back to the ship. We again had a car reserved from Enterprise (close by in the Via rail station) and got a map to help guide us. We went right to Peggy's Cove to try and beat a lot of the buses full of tourist. We were only behind one bus on our drive out, with double yellow no pass lines most of the way there. There was also not many places to stop for pictures on our way to Peggy's Cove but it was not crowded when we first got there. After looking around, taking pictures and getting more information from the information office there, we took a better map and road directions to take us along the water to Lunenburg. We continued on 333 North heading towards Tantallon to catch 3 West towards Hubbards where we cut across the Aspotogan Peninsula to East River, Chester, Western Shore, Mahone Bay and ended in Lunenburg. The drive was great and it seemed like half of it had shore and cove views. It was a relaxed drive with plenty of opportunities to stop for pictures. We enjoyed the ride and stopped a few places for pictures along the way. Once in Lunenburg we checked out the restaurants. I was thinking lobster would be good again, but the prices here were high. They wanted $29.99 for a 1.25 lb lobster and after having a great one priced at $13.99 in Maine, I went for a lobster roll as an alternative. I wanted to try one as I had heard about them a few places, but it was no great shake as the bread and flavoring did not compare to the lobster we had in Maine. Lynn had a seafood chowder that she really enjoyed. Lunenburg was touted as a nice location with a lot of historic older homes, but was not as exciting as we had hoped. After lunch, we headed North to catch 103 back (about 1.25 hours from there back to Halifax). If we did it again, maybe we would have done the Aspotogan Peninsula and then caught 103 back after touring along 3 to Mahone Bay. Once back in Halifax we drove around looking for a good bar, stopped by Alexander Keith's Brewery but did not stay as I did not see any darks and did not feel like paying $20 each for a tour. So, we turned in the car and walked back towards the ship. Well, lo and behold we went by Garrison Brewing which had $2 samples you could try. I got a dark, and a red while Lynn ordered a darker and la ighter red. Then back the ship for the night and our sea day back. Lynn: Our last four is Halifax, Nova Scotia where we rented a car. Got an early start and drove to Peggy's Cove; such beautiful scenery with many lakes on the way. Colors weren't very strong yet in this area but the views were breathtaking. Continued driving to Lunenburg ... many beautiful views on the way; ate lunch at the Salt Deli & had a wonderful bowl of chowder (Jeff a lobster sandwich) and then drove back into Halifax. Stopped at the pier at Garrison Brewery for some brew before boarding the ship. We relaxed, packed, ate, watched a movie in the room, had a cappuccino and latte while reading some in a lounge. At night we headed out and when walking on deck 16 found there was a water light display dancing to the music. We grabbed a seat and multiple blankets that were out on the chairs (this time) since it was high 50s and had a breeze. We stayed there and and ended up watching another Mavel Movie, Winter Soldier until heading for bed. Lynn: Had a wonderful cruise and was ready for RC day on Friday. Some early evening turbulence for a few hours that was pretty darn strong as we were coming into Halifax and leaving Halifax. We did walk off and took our own luggage off. It was smooth with no issues. The airport experience with Delta went as expected until we were on the runway and the pilot informed us that we were about 15th in line, and each plane would take about 3 minutes, so we were waiting over a half hour to take off. Oh well, a little late but all else when well, picking up our car then a stop at Cottage Inn to pick up two pizzas and a greek salad for dinner. Enjoyed the cruise as normal, although there seemed to be lapses in standard service we have come to expect from Princess. Small things like rough towels in the bath even though the ship was only 1 year old, not coming out the first night with blankets, popcorn and cookies for movies under the stars, wait staff not at the entry way of the buffet to tell you what area was open or to encourage you to use the antibacterial gel, and occasionally not coming to refill drinks or ask if you need anything. I would say it was a good itinerary, and I would do it again, but probably not something I would look to do unless there was a good deal and the timing worked. We only explored limited areas at each stop and could definitely do it again without covering the same ground.